The proud peacock on this pretty afghan will make anyone take a second look, and his colorful plumage will add a bit of splendor to any room. 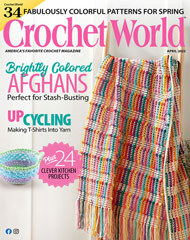 Made from worsted-weight yarn using Afghan stitch and a full-color graph. Size: 46" x 60".